FAWE is a tool capable of doing massive and blazingly fast changes to a world without impacting server performance. Primarily there are hooks for WorldEdit/VoxelSniper/PlotSquared which drastically improve their performance and add a lot of new functionality. Fixes bugs in WorldEdit such as block rotation, pasting entities, etc. I have changed 100,000,000 blocks for just 30seconds. 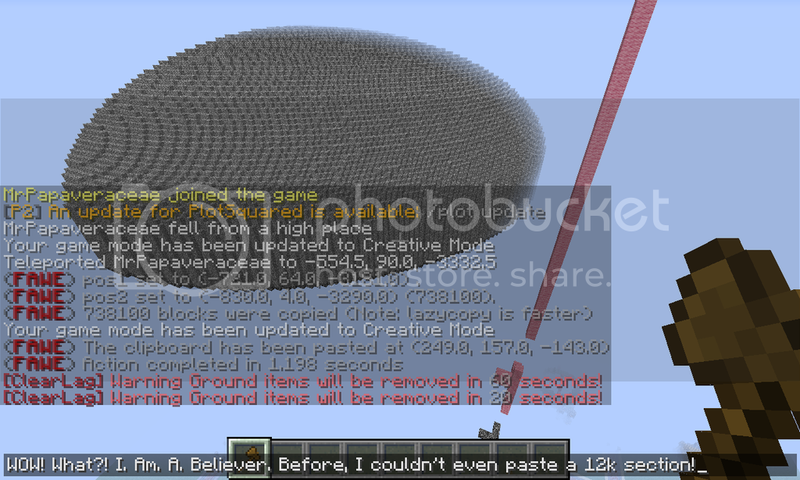 About 4 million blocks per second. Can you please make a version for the 1.8? Picture worth 1,000 thank you's! This is gonna make everything SO much easier! All my builds are massive. This one I'm doing runs in to the tens of millions of blocks and it's so frustrating to have to cut them up in tiny 10k block pieces and slows me down too, when I'd rather be building. This picture is just a tiny example of a piece of a build that is taken apart and the build has hundreds parts all together and has to be assembled pains-takingly cause I can't paste it all at once, or at least large chunks at a time. It also constrains and limits what I can do when I have to consider limiting myself of size and how many blocks I can paste at one time. I'm excited to see what I can do with this new plugin!